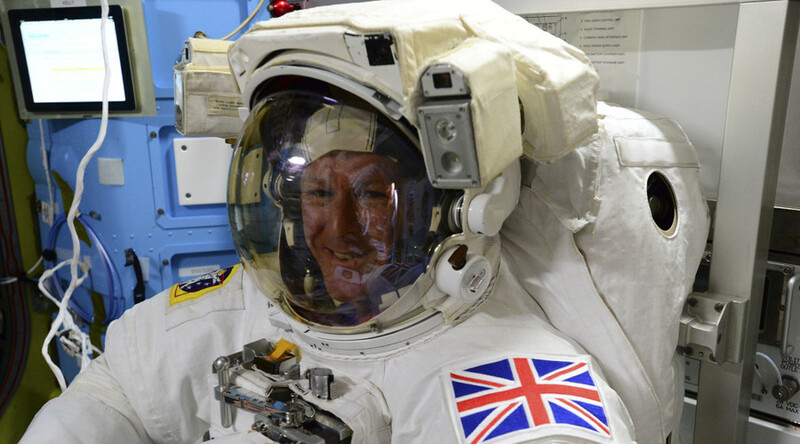 As thousands of London marathon runners pound the pavement on Earth, European Space Agency astronaut Tim Peake will be matching them step for step in his own digital, out of this world version of the 26.2-mile contest. Using a virtual reality app which replicates the London route, International Space Station inhabitant Peake aims to run the full distance on a treadmill, alongside digital avatar competitors. A bungee harness will keep Major Peake from floating away from his treadmill and give him a weight bearing of about 75 per cent of his body weight. Meanwhile, the British national has compiled a rocking playlist thanks to suggestions from his Twitter followers. It includes space jams such as Def Leppard’s Rocket, Supermassive Blackhole by Muse, and The Police hit So Lonely. Medical experts at the European Astronaut Centre in Cologne, Germany have the task of monitoring the expected 3.5 to 4 hour run, which is about eight times longer than normal space running exercises. And since the ISS travels at about 17,150 miles per hour (27,600 km/h), Peake will actually be circling the earth twice as he races towards the virtual St James’ Park finish. “The toughest part has been getting used to this harness system – it is not very comfortable to run in. It’s like running with a clumsy rucksack on, it tugs and pulls in different directions, and causes chaffing around the hips,” Peake explained at press conference, via video link. Energy gels and water pouches will nourish the astronaut as he tries to keep pace on the spaceship’s treadmill. Outside the realms of earth, Peake said he will also be counting on his crewmates to cheer him on, since he won’t actually be able to see his home from the ISS windows. “Unfortunately the treadmill isn’t located by the window, so one thing I won’t be able to do is actually look at planet earth as I run the race,” he said. While competitors will be able to soak their aching limbs in a normal tub, Peake will have to make do with a space shower. “Cleaning in space is just a little bit like camping – we have a hot water dispenser with flannels and towels, and that does the job. While Peake puts in the hard yards in space, Team Astronaut – a group of European Space Agency colleagues – aim to break an earthly record by completing the race while wearing replica Russian space suits. “To avoid injury and to meet health and safety requirements, my suit will be a little different [to a real suit]... the aluminium parts will be replaced by something a little softer and the hood will be modified slightly and folded back so I don’t melt by mile 2,” said ESA’s Jonathan Scott in the space agency’s blog.